'I'm a little fuzzy on the details, but I know that everyone is behaving as if they've just discovered that their favourite grandfather is a peeping tom,' says Mitali Saran. My eyes generally ricochet right off any business news, due to a condition in my frontal cortex known as liberalartsi majoritis. Business vocabulary puts me off. Over the years people have repeatedly explained terms like 'futures' or 'shorting the market' or 'debentures' to me; every time, I have one brief moment of comprehension before the concept sinks back into a swamp of shipwrecked words barnacled with numbers. I subscribe to a business newspaper at home only for the crossword. That I write in a business paper only proves the utter absurdity of the universe. But these days even someone like me is reading business news, perforce, because every inch of print from Business Standard to the back of cereal boxes is leading with who stabbed who at Tata Sons, and what they said to the media about it, and who besmirched whom, and whether they are lying. The Tata Group is the crown jewel of family businesses, today generating by far the highest number of really low puns ever seen in three-inch media headlines. I'm a little fuzzy on the details, but I know that everyone is behaving as if they've just discovered that their favourite grandfather is a peeping tom. The realisation that you knew all along, but didn't want to believe it. Our business unicorn has died. Maybe we're having a meltdown about it because we already feel let down by the Bollywood drama in Mumbai, where Raj Thackeray pointed his thumb-and-two-fingers gun at Bollywood and said 'Stick 'em up', and Bollywood handed over its wallet before he had finished speaking, and Chief Minister Devendra Fadnavis patted everyone on the head. So much for strong leadership -- how is the man going to stand up to foreign terrorists when he can't handle domestic terrorists? And so much for Bollywood, which preaches cross-border peace as loudly as it promises never to hire Pakistani actors again. Our liberal unicorn has died -- a thousand deaths, actually, because the Karan Johar-Raj Thackeray fiasco is only the latest instance of liberalism failing to have the courage of its convictions. On the upside, we know how to increase the tax net -- tax compliance is highest when it's an illegal, unreasonable tax based on some nitwit's anger management issues. All in all, the news has been depressing, not that the news is watchable anymore. Competitive oafish nationalism has made an embarrassment of journalism, including our broadcast journalism unicorn, NDTV, which officially stated that it would not question the army on the Uri strikes. Since you can't throw a pea without hitting a dead unicorn anymore, I'm considering becoming Asgardian. Asgardia, for those just tuning in, is a new satellite-based nation conceptualised by a chap who sounds like a made-up Russian villain but is actually a respectable scientist. Asgardia has a government, a charter, and a population currently over half a million. It is presently running contests to design its flag and anthem, and as soon as it is recognised by the United Nations, it will begin to issue passports to its citizens, assuming their own nations allow dual citizenship. It isn't physically moving people to space yet, but it might! For the moment, it exists online, on Web sites and on social media. Oh you think that's daft? Let me tell you, as you pick your way between rotting unicorns, that it might sound ambitious, but if ever this unicorn starts to disappoint, you won't have to live with the smell of its festering death-poop -- you'll just be able to log off. Hah, paying attention now, aren't you? 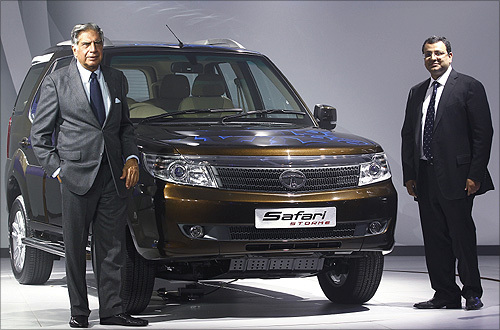 IMAGE: Ratan Tata and Cyrus Mistry in happier times.